Last November, I mentioned in detail Apple contacting me about a job opportunity with the iPhone/OS X design team. After taking time to ponder and reflect on the opportunity, I felt it wasn't the right move for myself or my family. I loved living and working in Milwaukee, helping independent software developers with branding and design challenges at MakaluMedia. These were the major reasons I decided to decline the Apple opportunity. Fast forward to spring 2008. Following several discussions with leadership team and design/development staff at Northwoods Software, I've been offered an art director position, which I have accepted. I start my new job in mid-May. After 10 great years at MakaluMedia, I'm taking the next step. This change was a very tough decision. I love the design work I do, the clients I help and the many colleagues I've had the pleasure to collaborate with. I've spent several years building a reputation for doing good design work, solving problems for my clients and being a designer who listens and is easy to work with. There is nothing wrong with MakaluMedia. I've loved my time at MakaluMedia. This change in direction is about new opportunities and challenges on multiple levels. This is the next step in my growth as a person, a designer and art director. Working for MakaluMedia since 1998 has been a wonderful experience. Matt Henderson, the owner of MakaluMedia and I have been through quite a bit together. I was Matt's first employee, leaving a position with Hare Strigenz, a Milwaukee print design firm. I'd developed a passion for the web and wanted to learn the new medium by diving in head first. I learned HTML from books and building sites in BBEdit. in 2003 I shifted from tabled design to web standards, thanks to Designing with Web Standards. I was the first MakaluMedia employee to work fully remotely. This was way back in 1998 when it was still a little quirky and unusual. I produced my design work on a Powerbook Wallstreet, with a 19" Sony CRT on a folding table in my apartment. I experienced a shift from larger design projects with the European Space Agency, to building a network of small, independent clients over several years. The first year was tough, but a long-term, steady approach to doing good work and making clients happy has paid off in many referrals, a backlog of work and profitability. By working remotely and having to build my own network of clients and partners, I've effectively run a small design business. I've enjoyed the entire process: finding clients, winning projects, solving design challenges, selecting and managing partners, producing the solutions, invoicing the work and promoting the work. These past 10 years have shaped who I am, formalized my iterative design process, provided a better understanding of business, built my knowledge of helping clients, improved my customer service and more. It's been a priceless experience. Becoming an art director at Northwoods Software is a step in my process of growth as a designer and a person. I'll be working on larger projects, exercising research, analysis, problem solving and visual thinking skills in new and different ways. I'm looking forward to bringing what I've learned to new projects and users. I'm very excited about working within a creative group again. Working alone has developed my focus, but I've missed being in an office with a small group of creative people. Over the years I've built a network of design colleagues online, but IM, Twitter and voice chats are just no substitute for having colleagues close at hand. Sharing with my team will be satisfying part of the position. I'm looking forward to offering up my 20+ years of experience in design practice with colleagues. I hope that all of the joy and pain gained from many years of working on projects with clients will benefit my colleagues at Northwoods. The company is focusing on new creative areas of expertise, and I'm extremely excited to be part of this. I'm hoping my skills and experiences in building a small design business from scratch will be helpful in this regard. Finally, the company attracted me with its unique working environment, including a private office with shower and toilet, ping pong tables, popcorn on Thursdays, workout and nap rooms and space outside for frisbee. Northwoods' family first approach and flexibility made a positive impact on me, as I'm coming from a pretty family-friendly and flexible work at home environment. All in all, I am very excited about this new Northwoods opportunity. I'm very thankful to Matt Henderson for the opportunity to be a part of MakaluMedia these past 10 years. It's been a great ride, I've learned quite a bit, and I know the team will continue to produce great stuff. I'm also grateful to the team at Northwoods, for making me a part of their team at this exciting time in the life of the company. I'm looking forward to being a contributor to Northwoods' success and growth. Yep, that's my own private office with a window, bathroom, shower and vanity. Northwoods has retrofitted an old hospital space for their offices, so every employee gets an office just like this. Pretty slick. Tracy takes the camera down the hall from my office, and shows the central area where the ping pong tables and other amenities are located. A few weeks ago, Northwoods picked up scooters for the team, and of course my friend Brian Artka had to show off his scootering skillz! Here we have Tracy capturing her thrill-a-minute extreme scooter ride! 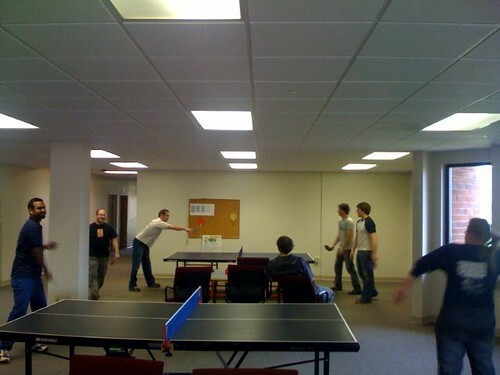 And here are several Northwoods team members playing ping pong. For the past few years, I've been very intentional about attending thought-provoking conferences and events, to learn, grow and meet new people. In 2007, I attended BarCampMadison, UX Intensive, SOBCon07, BarCampMilwaukee2 the SEED Conference and excellent monthly Web414 meetings through the year. For several years I've heard great things about SXSW (South by Southwest) Interactive Festival in Austin, Texas. Many of the people I admire attend yearly, I've enjoyed podcasts from the event, but it's never worked out for me to attend. That will change in 2008. On March 7th, I'll be heading down to Austin, with fellow Web414 members Ashe Dryden and David Overbeck. We're all excited to see first-hand, just what all the SXSW buzz is about. I've been given the opportunity to attend SXSW as art director and designer from MakaluMedia. I'm very thankful for this opportunity, and I plan to make the most of my time in Austin. I'll attend multiple sessions, take notes and capture sketchnotes similar to the ones I did at the SEED Conference and UX Intensive. I also want to meet old friends and new people while I'm at at SXSW. If you're attending SXSW Interactive 2008 and would like to meet for a coffee in Austin, drop me a line with the subject SXSW. I'd love to connect before I head down to Austin. SXSW Interactive 2008 — The official site. SXSW Interactive 2008: Panels (Time) — SXSW Panels, time schedule. SXSW Interactive 2008: Panels (Day) — SXSW Panels, by day. SXSW Interactive 2008: Panels (Category) — SXSW Panels, by category. SXSW Registrant's Guide — Registrant's guide. SXSW Registrant's Mobile Guide — Mobile registrant's guide. SXSW '08 Insider's Guide — Information and forums on Ning.com. SXSW Baby — Un-official Weblog and forums for SXSW. Ze Frank Explains SXSW Interactive In Under a Minute — Classic Ze Frank humor! SXSW Core Conversations — Directory for informal conversations. SXSW Past, Present, and Future — Great podcast interview with Hugh Forrest, Director of Events for SXSW Interactive on the history, culture and future of the event. SXSW Geeks Love Bowling — Bowling with SXSWers, Sunday, March 9th. Airbag: Hampton — Greg Storey's Guide to SXSW Newbies. John Phillips — Beginner's Guide to SXSW. Have a resource to share? Email me and let me know!